Irn bru may be one of those things you have to enjoy as a child – like marmite – to really develop a taste for it. Happily for me, I did, and in the right circumstances there’s little better than a cold, rusty orange, sweet, fizzy glass of it. It’s impossible to describe the taste. When I was growing up, the adverts told us it was “made from girders”, and that remains a good enough explanation for me. I volunteered to help my niece (the macaroon niece) with a Burns supper she was working on. We chatted about mini macaroons and deep fried mars bars as the ideal follow up to the obligatory haggis, neeps and tatties, and then it came to me: irn bru sorbet! Perfectly combining the roles of palate cleanser and sugar hit, it seems like the obvious missing link between main course and dessert. No Burns supper need be deprived of this Scottish equivalent of the trou Normande ever again. It wouldn’t do any harm to add a slug of vodka to it, either. This recipe is an adaptation of the wonderful Robin Weir’s (much more sophisticated) cider sorbet recipe. His brilliant book with Caroline Weir, Ice Creams, Sorbets and Gelati is my definitive guide to frozen desserts. Dissolve the sugar in the cold water, stirring until there are no grains left. Measure out the chilled irn bru and combine with the sugar syrups lemon juice. Refrigerate, if it isn’t completely cold. Start the ice cream machine, and pour in the bright orange liquid. After about 10 minutes, when the mixture is beginning to freeze, take your egg white, very lightly break it up with a fork (don’t make it frothy), and add it to the mixture in the machine. Continue churning until the sorbet is a light and fluffy snow. You will be amazed at how strongly it smells of irn bru! 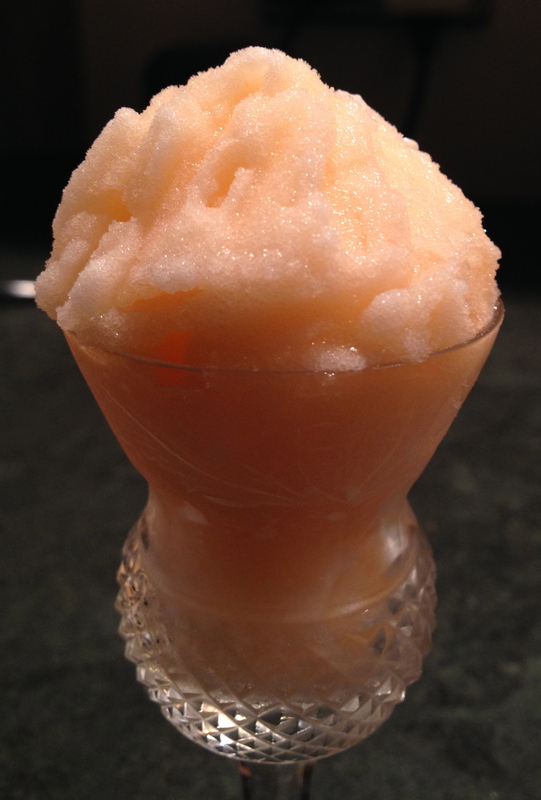 The sorbet gets paler and paler as it churns, ending up a pretty pale orange. If you want to retain the aggressive rusty hue of the original ‘bru, you could add some food colouring, but I don’t think this is essential. Serve immediately. If keeping for later, pour straight into a clean plastic container, cover the surface with greaseproof or waxed paper, seal with a lid, and freeze. Depending how hard it is when fully frozen, allow to soften slightly in the fridge for 10-20 minutes before serving from the freezer.